Home » Color » More Colors – Green! 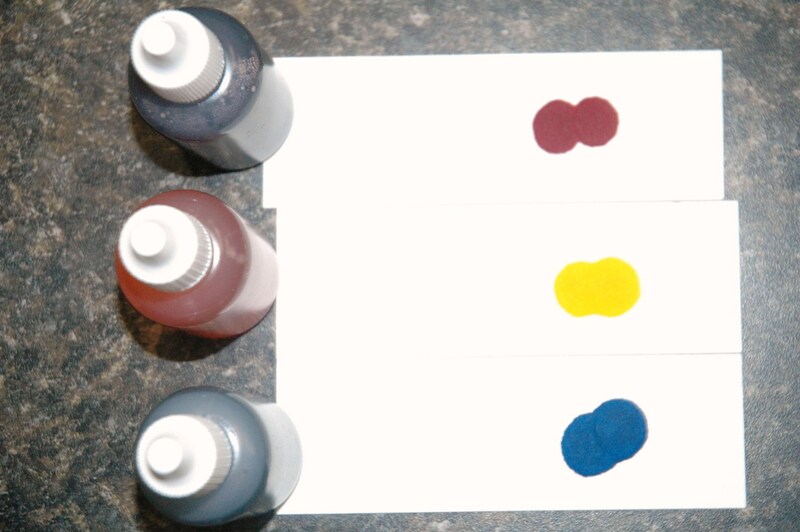 I’ve talked about mixing colors with the Water Soluble Colorant Kit, but what about colors that aren’t in this kit? Today, we’ll blend green. Did you know that green is approximately 70% yellow and 30% blue? This means that I need to start blending colors at these percentages. I’m going to find a color blend for tomorrow, since I’m going to make the Body Milk Gift Kit with Cucumber Fragrance Oil. Yippee! #1 Collect the premixed colors we made on January 12, 2009. Today we don’t need to use the red, but we will be using the blue and yellow. I also will be using Small Transfer Pipettes to stir and Sachet Cards cut in half for final color testing. 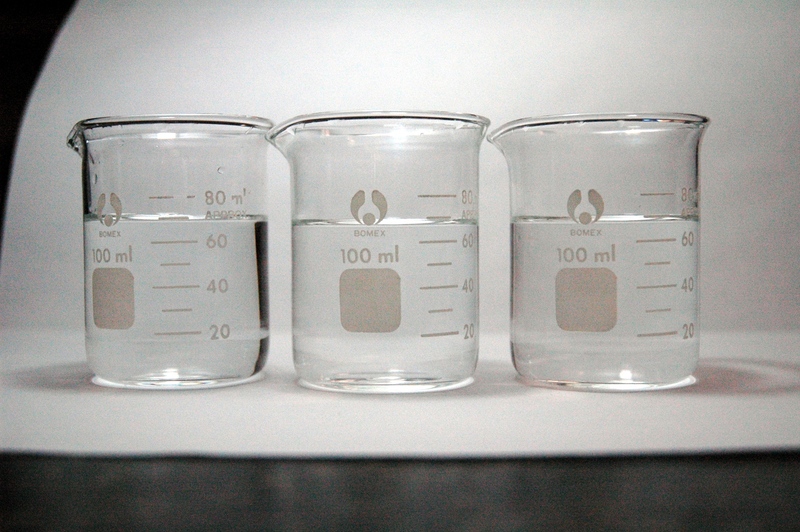 #2 For this testing session, I’ve also collected 3 small glass beakers with 70 mL of water. You can use clear drinking glasses, glass canning jars, or other small jars. I recommend using clear glass, so you can place the jar or beaker on white paper and easily see what the color looks like. 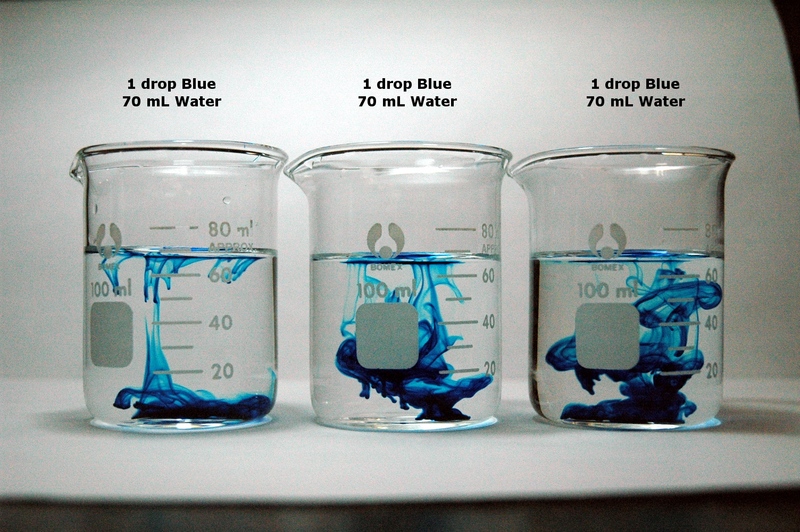 #3 I’ve added one drop of blue color to each beaker of water. 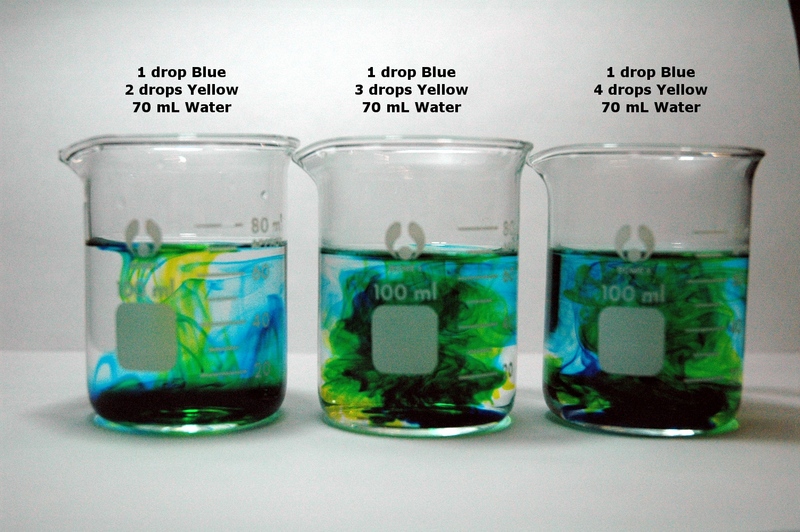 I think this is my favorite point in testing colors, because the color swirls in water. What can I say? It appeals to my inner child. #4 I’ve added yellow to each beaker of water. 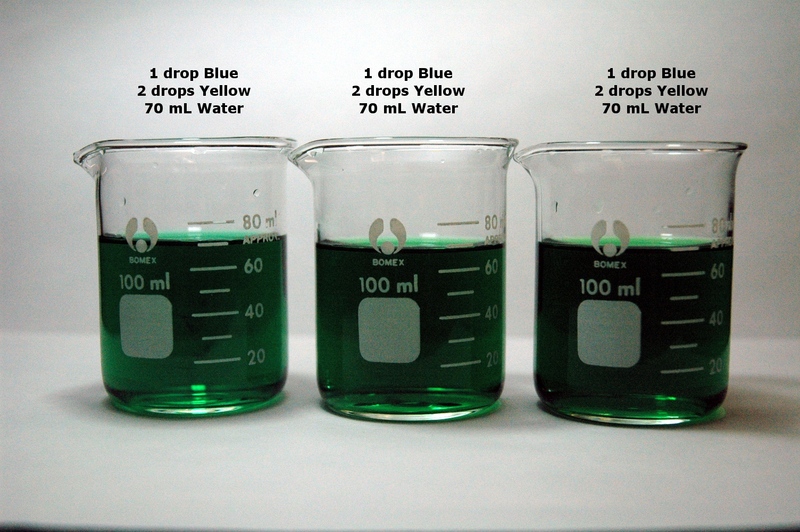 The beaker on the left has two drops of yellow, the middle has three drops, and the right has four drops. Using the pipettes, stir the water and blend the colors together. Darn! The swirls are gone. #5 All the color is now mixed. 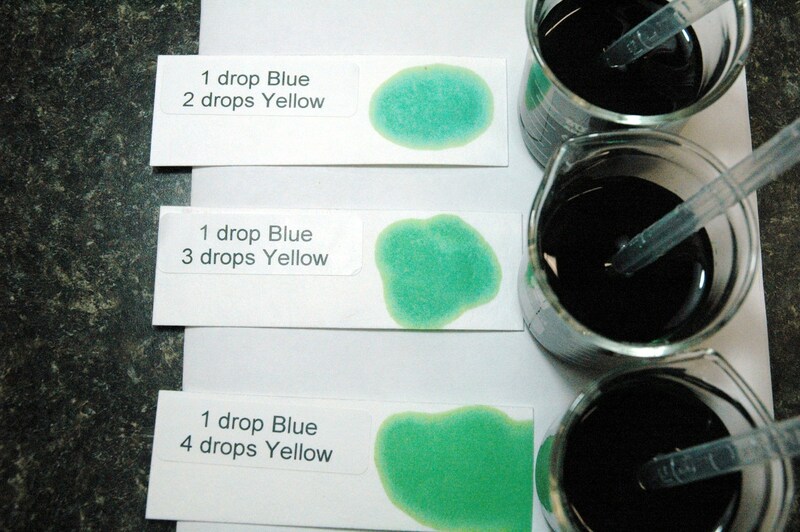 Grab the Sachet Cards or clean white paper to make color samples. 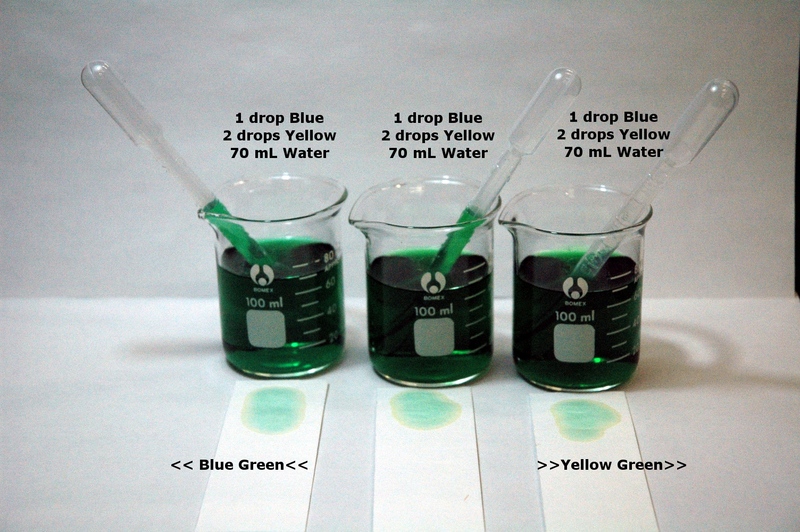 #6 Drop samples of color on clean paper. Compare the colors. #7 Let’s compare the colors. I think I like the middle color for a Cucumber-scented Body Milk, because the 1 drop of blue and 3 drops of yellow looks the outside of a cucumber. I think the top sample seems mostly blue, while the bottom sample seems too yellow. What do you think? Tomorrow we make green lotion!